This race centered on two stories, the first was like many a Monaco Grand Prix, were the crashes and retirements. A total of eight drivers did not finish; Gutierrez, Bottas, Vergne, Sutil, Kvyat, Vettel, Perez, Maldonado. And the fight up at the front that definitely got heated in the last laps of the race. The current World Champion Sebastian Vettel had another horrific race with another mechanical failure. At first the failure seemed to be in the ERS as it was in Qualifying and Practice, but after a short stop in the pits, he lost the gearbox in the car with it becoming stuck in first. Raikkonen used this opening opportunity to storm to the front and remain in 3rd for quite a bit before dropping back due to issues with his own car. As I sat there watching the race unfold, I would have never predicted the Finn going that close to the leading Mercedes duo. The Ferrari's this year just haven't been on pace to truly compete with the front runners, and least of all the Ferrari's has been Raikkonen who has been struggling with this year's car. And soon the Finn lost his edge to Ricciardo and dropped back a long way to a very lowly 12th overall. Alonso ever the man to show that even with a terrible car he can still perform, took Raikkonen's spot in the top ten but overall losing to Ricciardo. Further back, something no one could or would've predictied, Marussia received their first ever Grand Prix points! Bianchi did a terrific job and fought his way from 19th to 9th. Now there was some controversy over his original placement of 8th because the Marussia team did receive a 5sec stop penalty, however the race stewards just applied the 5sec penalty to his overall time and that put him firmly in the 9th slot. A fantastic result for the team. But the real story of this race was at the front. Rosberg and Hamilton fought each other tooth and nail. Then in the last 20 laps of the race, something got into Hamilton's eye. The gap between the two Mercedes went from barely a second between them, to a full five and a half seconds. Meanwhile, the shark like grin of Ricciardo was bearing down on Hamilton at incredible speeds. At one point Hamilton asked for the time between him and Rosberg, but the team told them about Ricciardo which was eight seconds. Hamilton told them he wanted the time for Rosberg not Ricciardo, but the team knew that Ricciardo was going full force towards Hamilton and that gap within 5 laps was down to 1 second. In the final laps Hamilton managed to get whatever was bothering his eye out, and Ricciardo couldn't close the gap enough to pass leading to another podium finish. 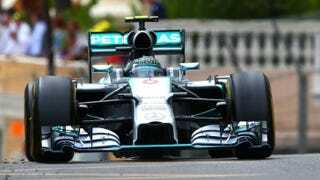 Rosberg meanwhile cruised to his second Monaco victory in a row. The fun begins now everyone. The Mercedes garages are going to truly heat up. Rosberg now has 122pts in the driver championship, and Hamilton with 118pts. Sparks are going to fly.